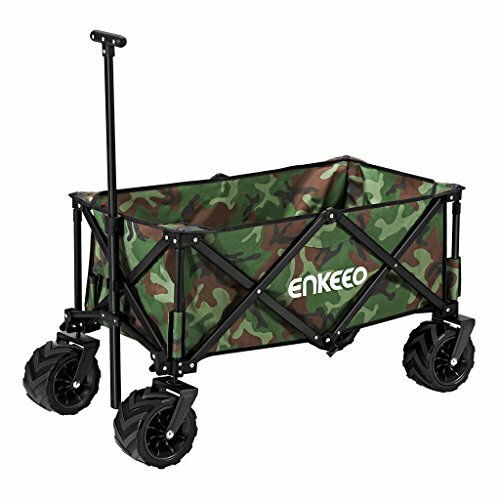 This ENKEEO utility wagon is designed to be long-lasting and durable with a large capacity to be your ideal outdoor activity assistant. You can store anything you want in this spacious wagon (35.4''x 17.7''x 11.8'') that is able to hold up 150 lbs weight effortlessly. Besides, it features an adjustable handle in the center with tilting function and an omnidirectional rotating front wheel, giving you excellent mobility and stability even in bad road conditions. It is collapsible to be folded into a portable size of 9.8''x 13.8''x 27.5'', you can take it around to anywhere anytime by simply placing it in a carry size bag (included). Equipped with reinforced tires (3.7''x 7'') and a steel made frame, this heavy duty and sturdy cart makes you confident all the time even in bad road conditions. It is a very practical wagon that is applicable in many uses, such as for camping, BBQ party, shopping in a mall, having a picnic or any other outdoor activities. To lower the handle, please press 2 buttons on the sides and shake the handle from side to side simultaneously, then press it down. Check the stability periodically and tighten the screws if they are loose. Do not use it under severe weather conditions such as burning sun, heavy raining or exceptional wet. Do not let kids play on their own for safety concern.